You really thought you were gonna mess with me? In my butcher shop? In Philly? The Spin: The helmer of last season’s finest hour (Belle Femme: Episode 1.9) returns to direct just a week following possibly the series’ finest hour thus far (Two Boats and a Lifeguard: Episode 2.8). Brad Anderson crafts another tight hour full of drama on both sides of the pond. While Nucky’s away in Ireland looking to score some whiskey for guns, Jimmy ascends to the throne awash in paranoia. 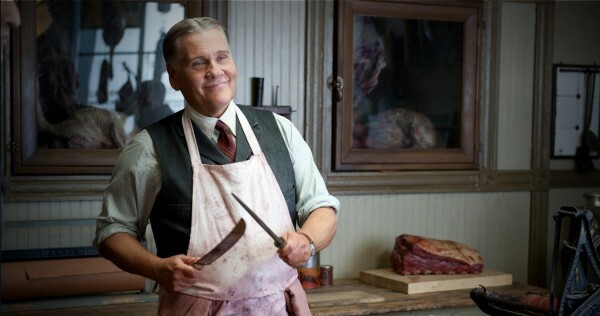 Jimmy gets Waxey Gordon to agree to take out Manny The Butcher of Philly (William Forsythe) leading to the episode’s greatest moment (hint: it involves a meat cleaver). Meanwhile, things more momentous are transmitted subtly and with great care – witness the take out of a certain elder Irish statesman at the last-minute so Nucky’s deal can be secured. This underhanded deal leaves Nucky with a bad taste in his mouth because Slater might be keeping secrets and all sons might like to kill their fathers. Meanwhile, on the home front…poor little Emily Schroeder is diagnosed with polio (which I reckon Mamma Margaret might see as God’s reckoning) while Chalky White (Michael K. Williams) takes his famously “hands-off” approach to starting a strike by utilizing none other than that chap he had his folks done whup in the prison cell earlier this season as his fire starter. Oh yeah, and that lady ADA Esther Randolph (Julianne Nicholson) is building her case against Nucky, utilizing her smarts along with her womanly wiles. Damn – things is heatin’ up on the boardwalk! Things Learned This Evening: NEVER EVER ATTACK A BUTCHER IN A BUTCHER SHOP! Wait Until Next Week: Manny The Butcher of Philly is turning into one of the most entertaining side characters – and he’s royally pissed off right now. How will Nucky comfort Margaret? How will the city react to the strike? How will Jimmy handle his first big crisis? This entry was posted in Boardwalk Empire: Complete Episode Guide, Pop Culture, Television and tagged Atlantic City, Battle of the Century, Boardwalk Empire, Boardwalk Empire Blow by Blow Episode Guide, Brad Anderson, Charlie Cox, HBO, Julianne Nicholson, Kelly Macdonald, Michael K. Williams, Michael Pitt, Mobsters, Prohibition, Steve Buscemi, Steve Kornacki, The 1920's, TV Series, William Forsythe. It’s interesting that the civil rights strike by the workers took on a 1950s/1960’s CIVIL RIGHTS tone aka thought out sit-ins and marches the closest comparison to the “i want a raise” scene in this episode. during that period there were few such pointed actions–mostly riots that were unorganized and swelled out of chaos–but made for an interesting story-line. generally, blacks were hanging on for dear life avoiding being lynched. few exceptions: ida b. wells who fought a one woman anti-lynching campaign in the early twentieth and a. philip randolph who won the right of the black brotherhood of sleeping car porters to be the first black organization as part of the american federation of labor in the 1920s. David, I’m fascinated by Chalky and am sorry his character development has receded. And clearly, I’m interested in the broader historical ramifications of all the characters including the African American characters.